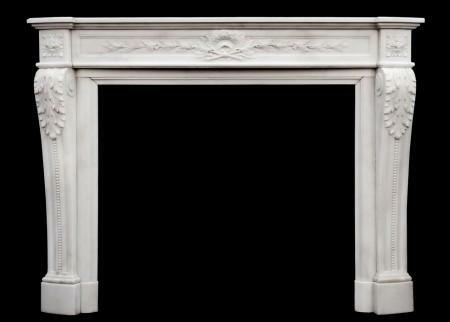 A fine quality French Louis XVI style fireplace in light Carrara marble. The shaped frieze with carved oval paterae to centre and beading throughout. The jambs with carved acanthus leaves and sprial rope moulding to scrolled base. Shaped, moulded shelf. 19th century. 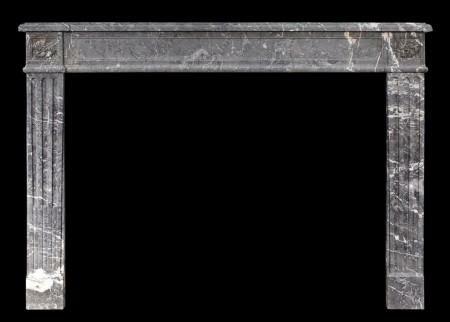 A good quality French Louis XVI style fireplace in veined Statuary marble. 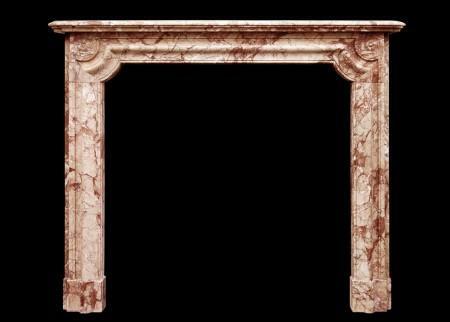 The jambs with rounded columns, surmounted by carved acanthus leaf capitals. The frieze with beaded panels and carved female mask to centre. Shaped, moulded shelf. 19th century. 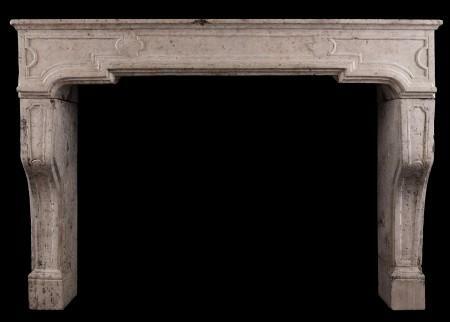 A 19th century French Louis XVI style stone fireplace. The fluted, shaped jambs surmounted by swirling carved paterae, the panelled frieze with moulded shelf above. 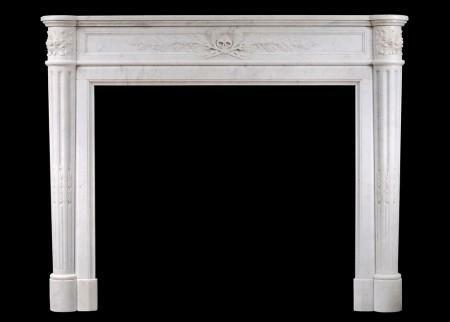 A small, well proportioned French stone Directoire fireplace. 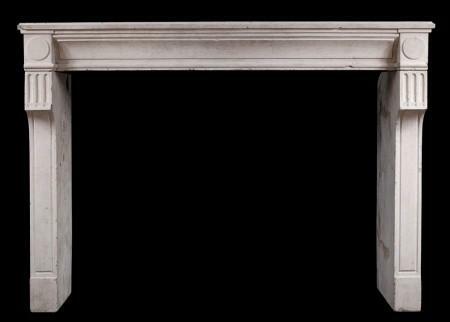 The jambs with half round columns surmounted by plain frieze and reeded shelf. Circa 1800. 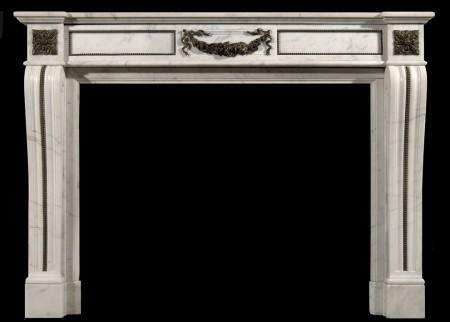 An elegant French Louis XVI style Saint Anne des Pyrenees marble fireplace, with carved capitals in Statuary marble. 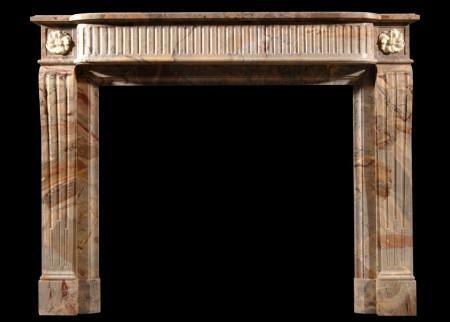 The jambs with half round columns surmounted by carved acanthus leaves. 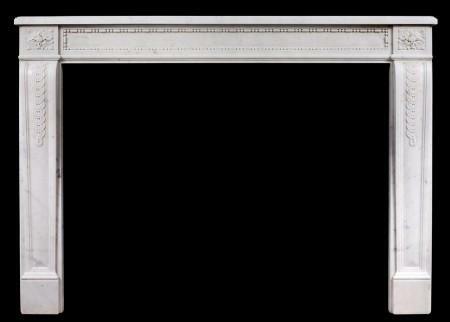 The panelled frieze with central plaque. Shaped, moulded shelf. 19th century. 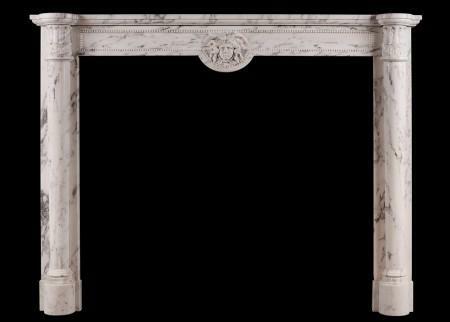 A 19th century French Louis XVI style fireplace in light Carrara marble. 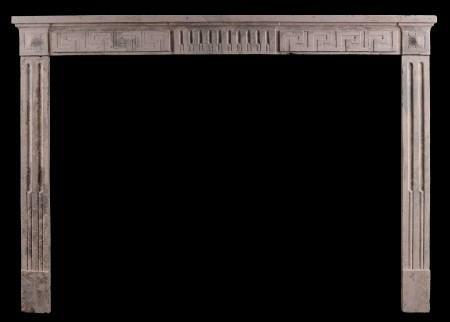 The carved, panelled frieze with tied laurel leaf and foliage to centre. The jambs with tapered, fluted columns surmounted by carved capitals. Panelled outgrounds. Shaped moulded shelf. 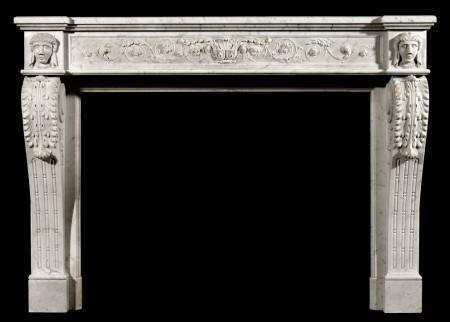 A very finely carved French Louis XVI limestone fireplace. The delicately carved frieze with diamond centre motif of rosette and husks, the jambs with leaves and foliage surmounted by carved round paterae. Directoire period with an Egyptian influence. Early 19th century. 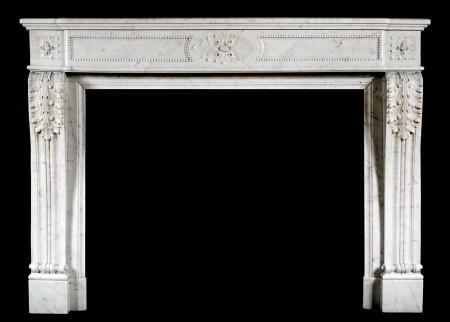 An early 19th century French Louis XVI style Carrara marble fireplace. The frieze with strung beading around centre panel. The shaped, panelled jambs with tapering carved scale motif. Circa 1830. 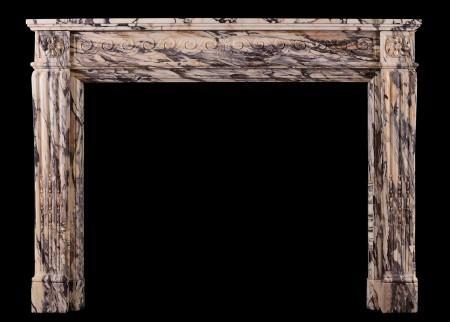 An elegant late 18th century period Louis XVI Statuary marble fireplace. The panelled frieze and jambs with trailing vine leaves, the frieze with centre motif of scrolls and leaves, and the jambs with tied ribbons to top. 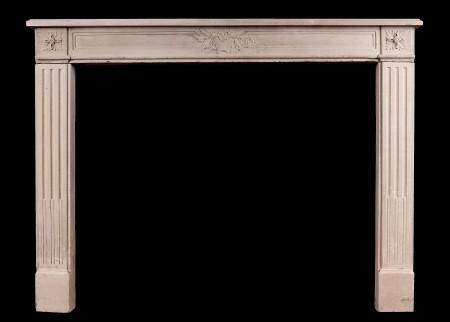 A fine quality period French Louis XVI style limestone fireplace. The stop-fluted frieze with carved centre panel of urn and foliage with moulding below. 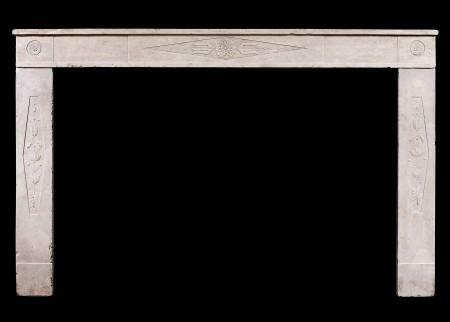 The jambs with a pair of tapering stop-flutes surmounted by carved square paterae. Breakfront, moulded shelf. A very attractive piece. 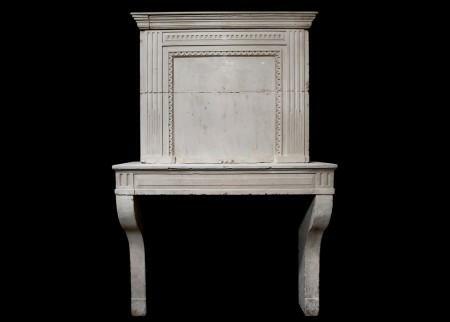 A very finely carved French Louis XVI in Carrara marble. 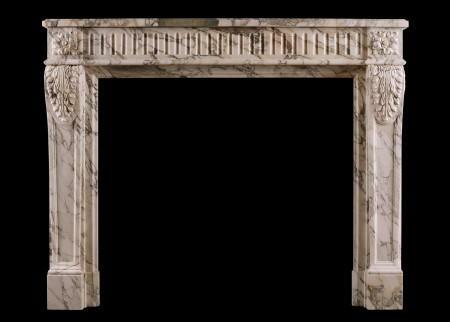 The panelled frieze with delicate pearl and string beading, scrolled ionic capitals and leafwork to end blockings. 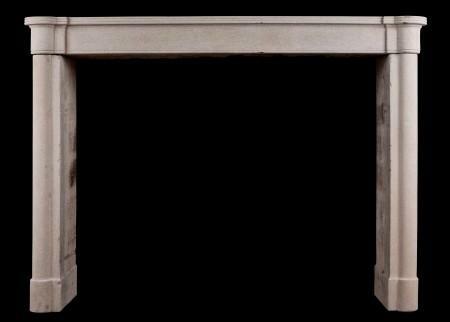 The jambs with tapering fluted columns with carving to middle. Breakfront shelf. Circa 1800. 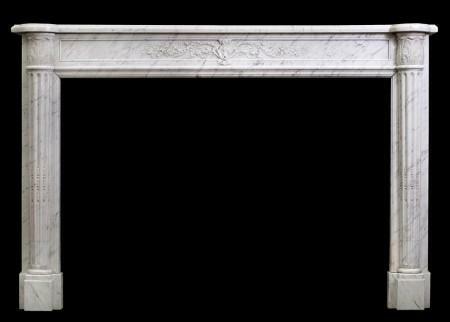 A fine quality 18th century Louis XVI French veined Statuary marble fireplace. The fluted jambs with tapering, half rounded columns inlaid with carved husks, surmounted by finely carved acanthus leaf capitals. 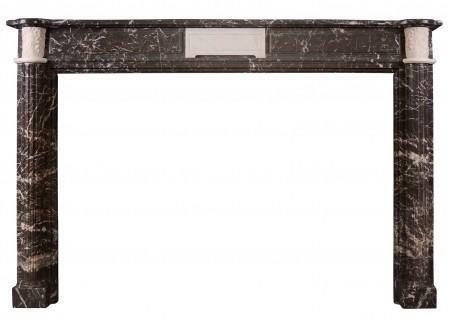 The finely carved panelled frieze with flowers and foliage, surmounted by moulded shelf. Circa 1790. 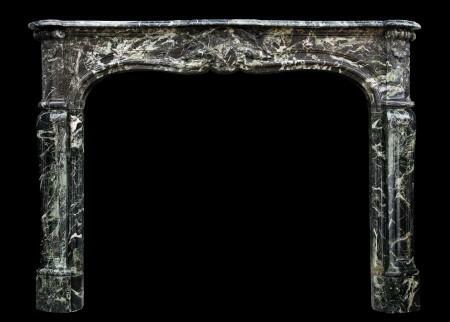 A 19th century French Louis XV style fireplace in green Tinos marble. The shaped, panelled jambs surmounted by frieze with carved shell and scrolls. Shaped shelf. 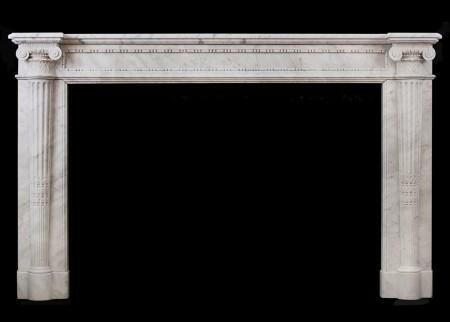 A late 18th century French Louis XVI limestone fireplace, with shaped jambs, panelled frieze with fluted blockings. 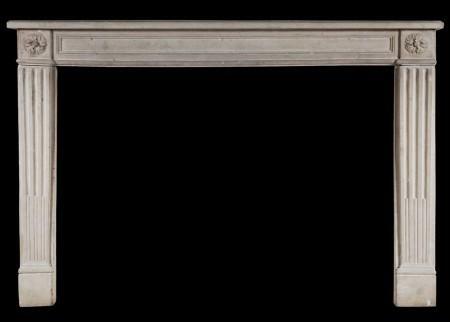 The trumeau with panelled centre, and dentil and fluted decoration beneath moulded cornice. A rustic piece in good condition. Priced to sell. 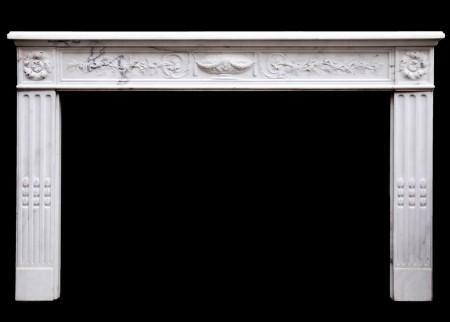 A French Louis XVI style wood fireplace with composition enrichments. 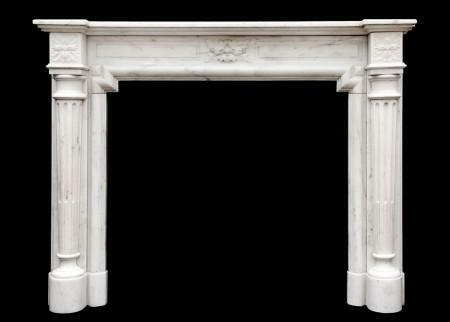 The stop-fluted jambs with tapering, half rounded columns, surmounted by finely carved acanthus leaf capitals. The frieze with guilloche composition throughout. Moulded, shaped shelf. Currently stripped but could be painted if required. 20th century. 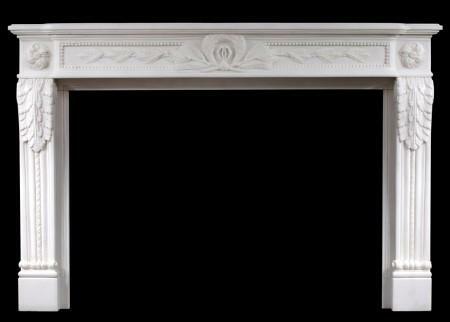 A French Louis XVI style pure white marble fireplace. The shaped frieze with carved garland and ribbon centre with trailing leaves and beading either side, the jambs with carved acanthus leaves with rope moulding surmounted end blockings with swirling paterae. 20th century. 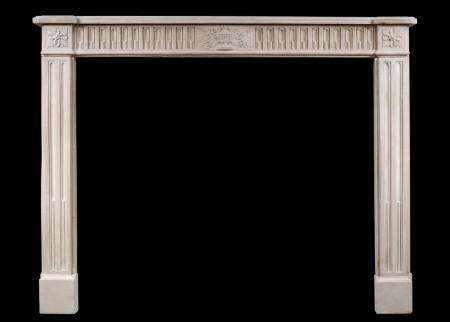 An unusually ornately carved French limestone fireplace in the Louis XVI style. The panelled jambs with gently shaped acanthus leaves surmounted by square carved end blockings. The frieze with centre ribbon, carved berries and foliage throughout. 19th century. 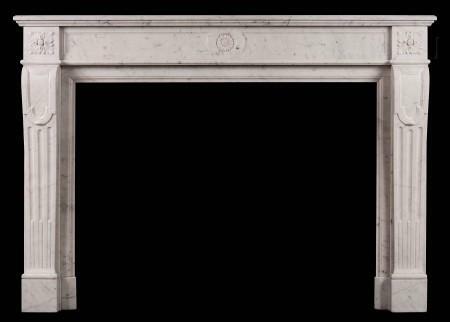 An elegant 19th century French Louis XVI fireplace in Statuary marble. The tapering stop-fluted columns surmounted by carved end blockings, the panelled frieze with carved leaves to centre, the returns with brass vents. Breakfront shelf. 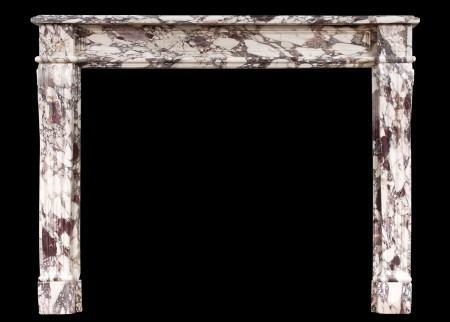 A 19th century French Napoleon III (circa 1870) Breccia Pernice marble fireplace. The moulded frieze and jambs and carved round pateraes to end. 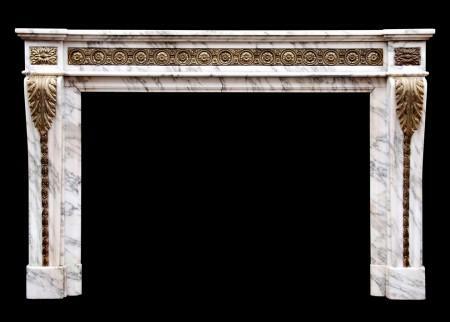 A fine quality 19th century (circa 1850) French Louis XVI style Statuary marble fireplace. 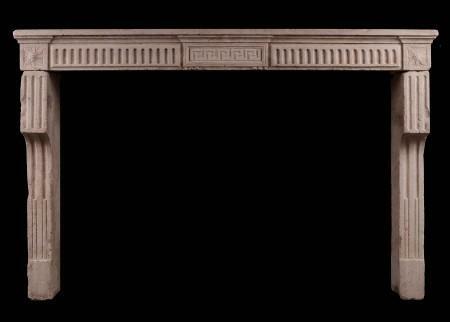 The shaped frieze delicately carved with laurel leaves, acanthus leaf jambs with beads, surmounted by square pateras. Breakfront shelf. 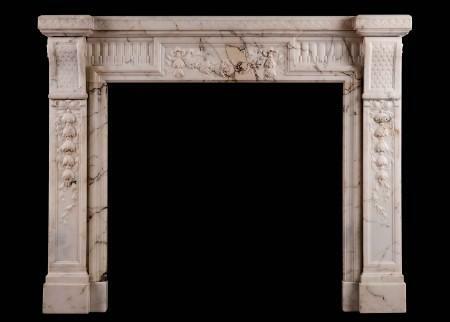 An unusual and nicely carved 19th Century (circa 1840) French XVI style Carrara marble fireplace. The frieze with scrolled foliage. The shaped jambs with acanthus leaves, surmounted by side blockings with carved female faces and square paterae to the sides. Provenance: From Roque Maure (Orange-Avignon) Hotel de Cubiere.